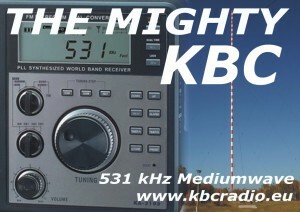 Once again, The Mighty KBC broadcast a two hour mix of music to the world on 9,500 kHz. Fortunately, I was able to record the entire broadcast--you can listen below. The KBC signal and audio out of their transmitter in Bulgaria were both excellent. There was very noticeable interference from the clandestine station, Radio Republica, who broadcasts at the same time (00:00-01:57 UTC) on 9,490 kHz. According to my spectrum display, Republica's signal had a bandwidth of 20 kHz! At times, I had to narrow my receiver filter to about 6.6 kHz and use a USB sync mode to keep KBC's broadcast clear. Still, you can certainly hear some of the noise from Radio Republica in the recording. Since Radio Republica is broadcast from the US, I'm curious if listeners in other parts of the world (or other parts of North America) had the same problem. If so, please comment! I'll pass this along to KBC.